From enterprise to small and medium business, university computing labs to call centers, the Intel® NUC is driving new models of computing in small spaces. 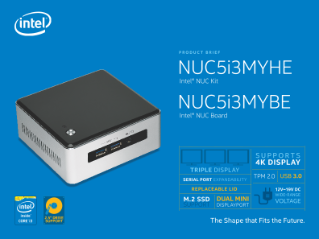 The Intel® NUC kit NUC5i3MYHE and Intel® NUC board NUC5i3MYBE, built with a 5th generation Intel® Core™ i3 processor, have a small footprint, but big potential. With 4K display support, it’s an ideal device for ...digital signage with video analytics, digital kiosk, intelligent vending, or PC replacement. The new Intel NUC kit and board are powered by the Intel® Core™ i3-5010U processor, providing an ideal combination of performance and reliability for usages where downtime isn’t an option. The advanced capabilities of the Intel® Core™ i3 processor gives your customers performance to run video analytics to help target and personalize messages and offers to the right audience. And the triple display capability means your customers can deliver their messages across multiple screens.